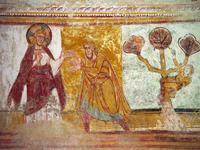 Fresco on the upper south register of the nave depicting God speaking to Abraham to call him out of his native country with a promise of land and posterity. St. Savin - Calling of Abraham, from Art in the Christian Tradition, a project of the Vanderbilt Divinity Library, Nashville, TN. http://diglib.library.vanderbilt.edu/act-imagelink.pl?RC=33460 [retrieved April 24, 2019]. Original source: Images donated by Anne Richardson Womack, Vanderbilt University, and James T. Womack, Montgomery Bell Academy, Nashville, TN.